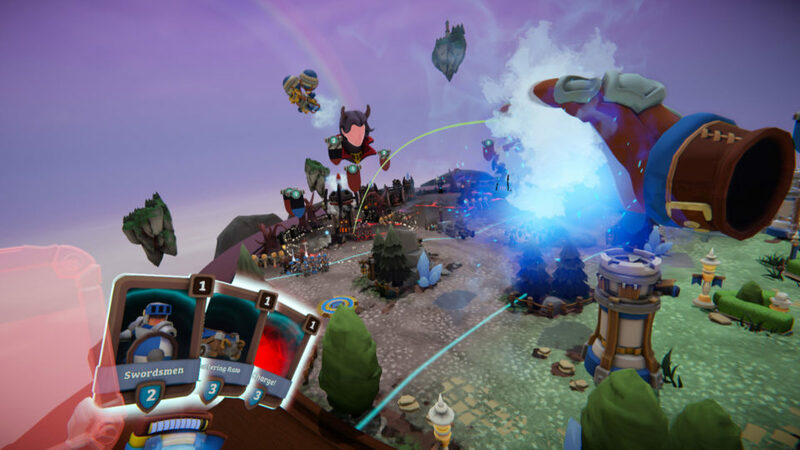 While we have seen a few strategy games in VR, we honestly haven’t seen enough quality ones equalling the depth and fun of our non-VR counterparts. 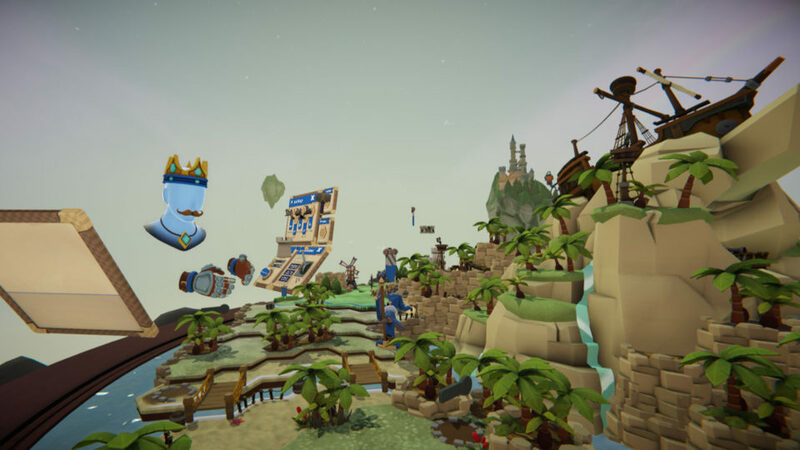 Skyworld is a turn-based strategy game with some real-time battles and a complex resource management and upgrade system in a fantasy realm where the populace lives on floating islands. These islands are now being assaulted by a demonic horde and it’s up to you to save all the Skyworlds and send the hell spawn back to their pits. Welcome to your world…in the sky. You need 2 Move controllers and the action here is of the point-and-click variety with each of your hands being used to navigate the menus and sub menus. The one main menu window has a few category windows to open up. Once you open a window you can place it anywhere around the play area for easy access or close it down. 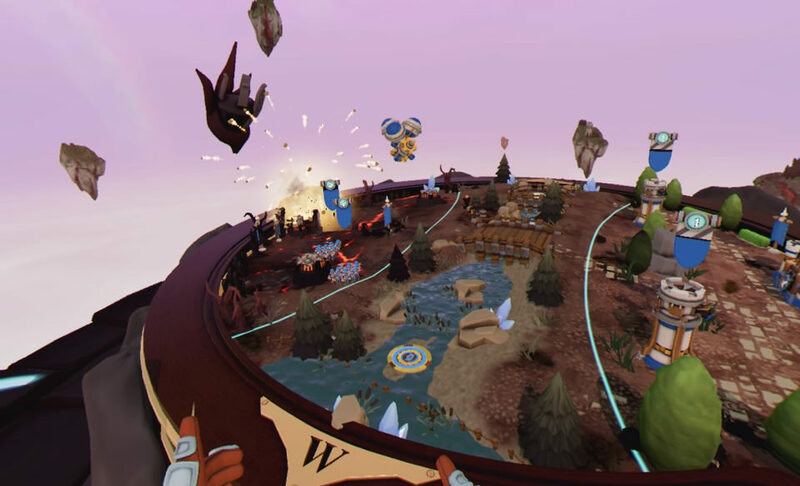 The play space acts much the same way with you pointing at buildings, your commander or castle or anything else on the map that can be interacted with, giving you whatever info you may need to know about whatever it is you are pointing at, very much in traditional strategy fashion. You can perform as many actions as you can per turn allowing you to micromanage your expanding base and engage the target. Combat is handled a little differently with you leading you commander around the circular map. Once your commander meets another, they will engage whereupon this turns into a card-based battler with real-time elements and some environmental strategy as well. In this mode, you constantly accrue points which can be spent on troops. Once you pick a troop, you can place it on the battlefield on a predetermined path to the enemy base with 3 major paths being available. Besides troops you can also summon spells to aid your troops, like a fireball or freeze spell, which can change the tide of battle with the goal being to destroy the enemies base at the other side of the map. In the central section of the map are 3 areas which, when whoever’s troops walk over it, summons a blimp that will slowly pick apart the enemy base adding a new level of strategy as you have to constantly focus on defence and offence. Navigating the menus can be a bit of pain, but in no way is it broken, and besides that minor issue, my only complaint would be the need to grab the table and slowly spin it to whatever position you want, which gets more and more tedious as you expand your area of control. Build your deck and unleash!!! The actual micro-managing of your base involves resource collection where you must build specific buildings to collect iron, wood, stone, magic or food. You need these resources to upgrade your current buildings and troops but having these buildings is not enough as you need to assign citizens to these buildings to make them active. You start with only a few people to do this so to expand you need to attract more people by managing taxes and food. You can increase the population by lowering taxes and increasing rations, but you do so at the risk of not being able to purchase much-needed upgrades for that turn and dramatically taxing your food stores. On the flip side you can tax the heck out of your people and maybe save some food for a later turn, but the populace will drop, abandoning your buildings so it becomes a balancing act of when to expand your base and when to hunker down and nurture what you have. Upgrades for anything cost all of the resources you can accrue, and you need to upgrade your troops and spells as the enemy is doing the same so you will face more and more difficult foes. Skyworld looks beautiful with cartoonish visuals that carry a lot of detail. The Skyworld before you is a circular map divided into regions that can be controlled by you or the enemy. From your vantage point at the edge of the table you can see all the lands which include your castle and smaller resource buildings. Depending upon the level the scenery may change up a bit though this nothing more then aesthetic but does add to each world feeling unique. The coolest visual element in Skyworld is the table in front of you which will flip upside to whatever option you choose. If you choose the throne room for instance, the map overview will flip underneath as the interior of the throne room is displayed. This goes for every other option with battle bringing you in a little closer to the action. Across from you will be your opponent’s avatar, which is customizable, with the map laid out in front you. At any time, you can grab the edge of the table to lower or raise yourself or rotate the entire map in the direction you choose letting you get a better vantage point. Audio is exactly what you would expect with everything making the sounds they should with your helper dude chiming in whenever anything of importance occurs or you try and perform a specific action. All in all, Skyworld does an excellent job at presenting its world I really can’t find any faults with the presentation and it’s very clear a lot of effort went into making this as clean a looking game as the developers could. You can customize your face and place menus wherever you like! The biggest issue to be aware of would be just how complex the game can be. The opening tutorial stage is a little overwhelming as your guide takes you through all the individual mechanics from raising buildings, managing population and economics as well as upgrades, unlocks, battles and a host more options. I’m not knocking the depth of the game, far from it, but it can be a little daunting when every time you perform an action, your helper dude shows up and tells you 4 other things you need to do at the same time. It wasn’t until stage 3 when I truly began to appreciate just how complex is, which is coincidentally when my enemies started to up their game. There are 8 stages in total, which may not seem like a ton, but as each one gets steadily more difficult, the campaign will probably take you in the 6 to 8-hour range to complete. Of course, you can also play skirmish mode against the AI or if you are feeling dangerous, tackle the online play which has you faced up with a human opponent and is also a ton of fun. I wasn’t initially a fan of the combat as it reminded me very much of more mobile based games similar to what we saw in ‘League of War’ though thanks to the upgradeable card system, multiple paths, your own magical attacks and the blimps in the middle, strategy definitely plays a large factor that the early stages might not suggests as spamming troops in the initial 2 stages seemed to be the way to an easy victory. Despite my initial impressions, which weren’t bad…just a little over and underwhelming, once I figured out all the game’s mechanics, I soon enjoyed the very addictive gameplay. Later stages offer up a ton of challenge which pushed my skills to their limits, and I had a blast doing it. The addition of skirmish and multiplayer mode puts it’s above many of its competitors and the total package here is solid. 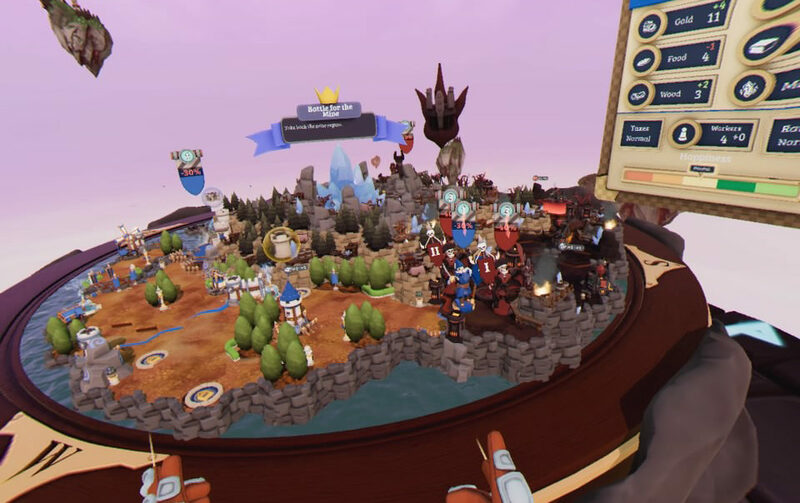 If you are looking for your next VR strategy game, Skyworld will not disappoint! What would I pay? The $30 asking price is perfect. The single player campaign almost justifies that cost alone and the added multiplayer and skirmish modes are the icing on the cake. If you like strategy, you’ll like this. 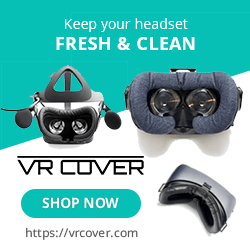 Vertigo Games provided The VR Grid with a press code for this title and, regardless of this review, we thank them for that!